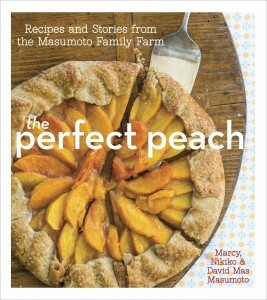 “The Perfect Peach: Recipes and Stories from the Masumoto Family Farm” by David Mas Masumoto, Marcy Masumoto and Nikiko Masumoto, will be published by Ten Speed Press, a Division of Random House, in June.This cookbook showcases the luscious flavor of peaches in 50 sweet and savory dishes, drawing on the life stories and experiences of America’s foremost peach farming family, the Masumotos of California’s Central Valley. The family’s amazing heirloom peaches — which are available for a few weeks each year at the best produce markets and top restaurants in the country — are widely considered the best peaches in the world. Their debut cookbook gathers the family’s favorite recipes, from classics like Hearty Peach Cobbler, Peach Chutney, and Slow-Cooked Pork Tacos to inspired combinations such as Prosciutto-Wrapped Peaches, Caprese with Peaches, Spice-Rubbed Pork Chops and Grilled Peaches, and Stuffed French Toast. And the pristine flavor of a just-picked summer peach can be enjoyed year-round with the easy-to-follow instructions for drying, canning, freezing, or jamming the best of the harvest. With rich recipe and location photographs fresh from the orchard, “The Perfect Peach” paints an intricate portrait of an organic farm that has been in the family for four generations. Accompanied by eloquent essays that evoke the soul of family farming and the nuances of a life filled with peaches, this book is for anyone who longs to savor the flavor of a pristinely ripe peach. The book can be preordered from Random House, Barnes & Noble, Amazon.com, Powell’s Books, and Elliott Bay Book Company. The Masumoto Family Farm (www.masumoto.com) consists of 80 acres south of Fresno and grows certified organic peaches, nectarines and grapes (for raisins). The first acres were purchased in 1948 by Takashi “Joe” Masumoto. With family labor and a stubborn resilience, the Masumotos enriched the soil and planted roots. Mas Masumoto is the author of “Wisdom of the Last Farmer,” “Epitaph for a Peach,” “Harvest Son,” “Four Seasons in Five Senses,” “Letters to the Valley,” “Herilooms,” “Country Voices,” and “Silent Strength,” and a columnist for The Fresno Bee. He has served as chair of the California Council for the Humanities, is a board member of the James Irvine Foundation, and was recently appointed by President Obama to the National Council on the Arts. His wife, Marcy, is co-owner of Masumoto Family Farm, project director at the Central Valley Educational Leadership Institute at CSU Fresno, and, since December, a trustee on the board of the Sanger Unified School District. She recently co-authored a paper published in the Journal of Research in Rural Education. Their daughter, Nikiko, graduated from UC Berkeley with a bachelor’s degree in gender and women’s studies and completed a master of arts in performance as public practice at the University of Texas, Austin. Her projects include “What We Could Carry,” a one-woman show based on testimonies from hearings of the Commission on Wartime Relocation and Internment of Civilians. Mas and Marcy Masumoto also have a son, Korio, who graduated from Sanger High School and is a student at Fresno City College. He excels in long-distance running and is studying psychology.